Researchers say it represents an entirely new class of fungi: the Archaeorhizomycetes. Like the discovery of a weird type of aquatic fungus that made headlines a few months ago, this finding offers a glimpse at the rich diversity of microorganisms that share our world but remain hidden from view. 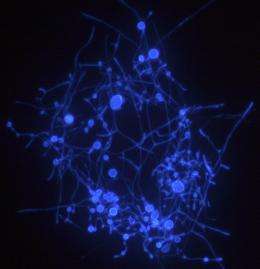 The fungal phenomenon, brought to light by researchers at the University of Michigan, the Swedish University of Agricultural Sciences, the Imperial College London and Royal Botanic Gardens and the University of Aberdeen, is described in the Aug. 12 issue of the journal Science. Although unseen until recently, the fungus was known to be extremely common in soil. Its presence was detected in studies of environmental DNA---genetic material from a living organism that is detected in bulk environmental samples, such as samples of the soil or water in which the organism lives. "You couldn't really sample the soil without finding evidence of it," said Timothy James, a U-M assistant professor of ecology and evolutionary biology and an assistant curator at the university's herbarium. "So people really wanted to know what it looks like." That became possible thanks to the work of the Swedish researchers, led by mycologist Anna Rosling. 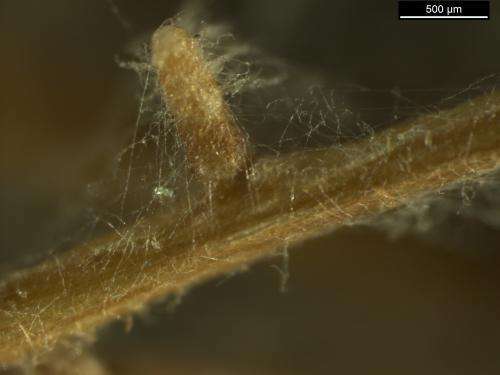 The researchers were studying mycorrhizae---fungi that colonize plant roots---when they discovered that some root tips harbored not only the mycorrhizae they were interested in, but also an unfamiliar fungus. "When culturing mycorrhizal fungi from coniferous roots we were exited to find that one of the cultures represented this unfamiliar fungus," said Anna Rosling. Later the culture was identified as a member of Soil Clone Group 1 (SCG1), a ubiquitous but enigmatic lineage known only from environmental DNA. It's not especially impressive to look at, James concedes: "It doesn't make some crazy structure that nobody's ever seen." But simply seeing and photographing a form of life that's been invisible until now is cause for excitement. Having in hand a member of the elusive fungal group, the Swedish scientists and their collaborators have been able to study the group in more detail than ever before possible, using electron microscopy, DNA sequencing and in vitro growth studies to characterize it. 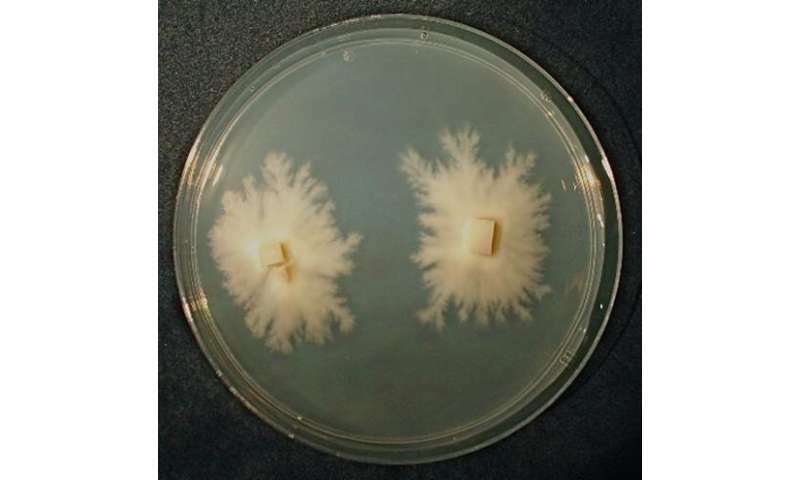 The fungus they cultured is a slow-growing form that produces none of the typical aerial or aquatically dispersed spores most fungi typically reproduce with, suggesting it seldom if ever sees the light of day. "By finding that it is slow growing and only produces spores in the soil, we can provide an explanation for why it has taken so long to be cultured," James said. The researchers also performed experiments aimed at understanding how the fungus, dubbed Archaeorhizomyces finlayi, interacts with the environment and with other organisms. "We don't have any evidence that it's pathogenic; we don't have any evidence that it's mutualistic and doing anything beneficial for the plant," James said. "It's a little bit of a boring fungus." It may, however, help break down and recycle dead plants, a common---and extremely important---job for fungi. Hints of this role come from the observation that A. finlayi grows in the lab if provided with food in the form of glucose or cellulose (the main structural component of plant cell walls). "Because it is so common in the soil, it must be very successful at what it does, and that role must be ecologically relevant," Rosling said. Now that the researchers have ruled out some typical fungal roles---such as pathogen, benign endophyte, and member of a mycorrhizal association---they hope to find out through additional experiments exactly what role the fungus does play in nature and how it interacts with plants and other fungi. "At this point we're still in the early stages of understanding what it's doing out there," James said. Whether A. finlayi turns out to be beneficial or detrimental to the plants or microbes it interacts with, it's sure to contribute to understanding the diverse array of fungi in the world. Though environmental DNA of SCG1 had been collected and reported in more than 50 previous studies, the type of DNA collected in the past didn't lend itself to analyses that would definitively pinpoint the group's position on the tree of life. "Now that we have the culture, we can sequence almost any gene we want, so that's what we've done," James said.